Odd title wouldn't you say? Well I have combined 2 challenges in 1 again and I just love how this turned out. For Summer of Colour this week Kristin our host has chosen Red as the theme and as an added bonus " wings". If you have been following my adventure in the colour challenge you know my main focus was cardmaking but I decided to take a break and make an altered canvas. I already had a canvas covered and distressed so I used that as my base. 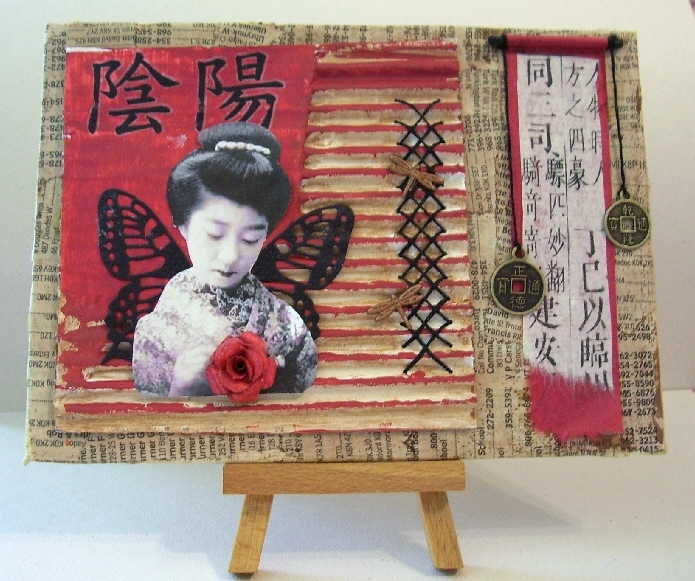 I used corrugated cardboard which is the theme over at Just For Fun and used it as a backdrop for my Geisha who is sporting wings. I just got some new die cuts and these ones are beautiful butterflies ,I just had to use them in this piece. I distressed the corrugated cardboard first by painting with gesso, then I washed it with some Spice Brown acrylic paint, then used the credit card technique and applied the red. I added stitching and Chinese character rub ons. I added dragonflies and placed them in the area of the stitching. I made a scroll to hang along the side and added some Chinese coins. I really like how this turned out. I always have fun with my Asian themes. Thanks for looking and remember to check out Kristin's blog and all the great participants in the Summer of Colour Challenge and take a peek at another fun blog from the UK called Just for Fun. This is so wonderful, Les! I think this is one of the best (or maybe THE best) Asian pieces you've ever done! I love it. Fabulous work! ooh she's lovely... loving the corrugated.. guess what I found at work today???? lol yup a beautiful sheet of very soft corrugated... love her you did a great job ..
Lesley - your geisha is just delightful! I love this. So much texture. This is so lovely ! Your Geisha is gorgeous , love her wings and all the other lovely elements here, the red is perfect for this. Love this great card- love the red and wings- great card! Beautifuly put together. Love it! I love how your scroll turned out. A geisha with wings, now there's a thing! Love the die cut. WOW! You do asian themes so well Les! This is brilliant project for red week! Loving the touch of corrugated cardboard, the stitching and the scroll are amazing :) Fabulous work! The whole thing is so fantastic!! I am amazed at how you can combine so many different things and make it all work together. oh this is just beautiful!! !